Submitted 10 months 1 week ago by feeds_user. Cabela's Fury Hunting Pack Integrated kickstand, seat and backrest Two removable screen blinds for maximum concealment Kneel on the seat and use the telescopic rifle rest Ultraquiet and durable CTS450 material Pull-out bow/rifle carrying system Contoured shoulder and sternum straps Haul all your gear deep into the backcountry, take a seat and take your shot using Cabela's Fury Hunting Pack. Pick out your hunting spot and pull out the kickstand. 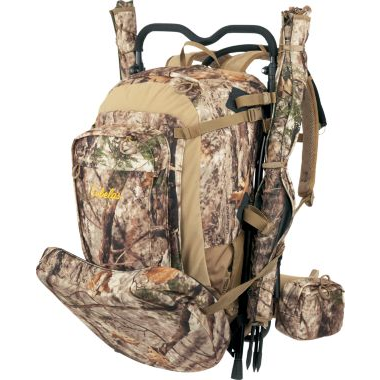 The padded seat and backrest ensures you're comfortably waiting for wildlife anywhere. CTS450 tricot material with a 600-denier polyester bottom remains quiet in cold conditions while withstanding the toughest hunts you can put the pack through. Four internal mesh pockets and a key fob, plus an external zippered compartment keeps gear organized. Pull-out blaze flag keeps you visible. Integrated bow/rifle carrying system. Airflow back panel allows ventilation between your back and the pack. Contoured shoulder straps, padded waistbelt and an adjustable sternum strap keep the pack secure and evenly distributes weight. Detachable waistbelt compartments keep your electronics and accessories secure and easy to access. Includes two removable screen blinds for maximum concealment. Either leave them attached to your pack and unroll, or detach and use the integrated stakes for a custom blind. Kneel on the seat and use the telescopic rifle rest to steady your aim. When all your gear isn't necessary, detach the smaller, padded daypack and haul the essentials to your hunting spot. Includes 2-liter Source hydration system. Imported.